Protein rich in casein micelles. Milk protein rich in high quality casein micelles that are absorbed slowly and in abundance comprise the main raw material of Blue Dragon Protein Powder. Unlike other low-cost manufacturing methods, it is made with a sophisticated ultrafiltration technique that keeps the bioactive peptides intact. 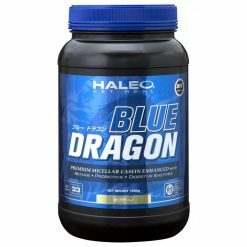 A serving of Blue Dragon Protein Powder delivers 20mg of protein. It has 500mg of betaine added per serving to enhance exercise performance. It contains 100mg of an enzyme-containing fermented grain extract per serving, with protease, lactase, and highly stable probiotic activity (60 million Bacillus coagulans microorganisms) to improve digestion. Milk protein rich in casein micelles is notably thick compared to regular whey protein. This unique texture allows for slow degradation and increased absorption in the gastrointestinal tract. Mix one level scoop of (30g) with 250ml-300ml of water or your favorite beverage. 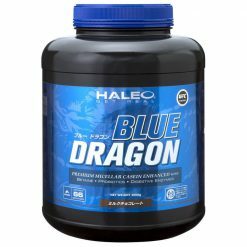 Increase your daily protein intake by drinking Blue Dragon together with meals, or add Blue Dragon to your favorite recipes. Ingredients: milk protein, instant coffee, grain fermentation extract, spore lactic acid bacteria, betaine, emulsifier, flavoring, sweeteners (sucralose), (some raw ingredients contain milk, wheat and soybean). Ingredients: milk protein, cocoa powder, grain fermentation extract, spore lactic acid bacteria, betaine, emulsifier, flavoring, sweeteners (sucralose), (some raw ingredients contain milk, wheat and soybean). Ingredients: milk protein, cassis powder, grain fermentation extract, spore lactic acid bacteria, betaine, emulsifier, flavoring, acidulant, sweeteners (sucralose), (some raw ingredients contain milk, wheat and soybean).